Time for another recipe! I know I promised I’d let you in on my Liquid Armor coffee concoction…and I will…but first, I wanted to share with you my latest discovery/creation: Almond Milk Coffee Creamer. It’s so easy to make, and it’s 100% natural…no added chemicals, preservatives, or processed sweeteners. Plus, I find that the store-bought almond milk in my coffee never turns it the right color. I like mine to be a deliciously smooth caramel color. So after stumbling on a few recipes online for homemade almond milk, I decided to tweak it a bit to make a more concentrated, creamier…um…creamer! *As an aside, you could use this same recipe and make regular almond milk (rather than creamer)…just increase the water to 3-4 cups. 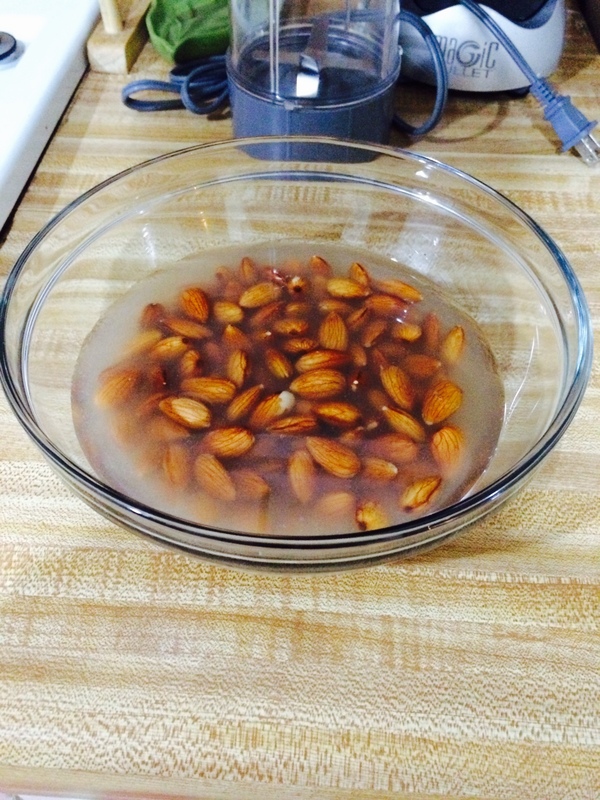 Measure almonds into a bowl and add enough water so that the almonds are completely submerged. Let soak 6-10 hours. These just finished soaking…left them on the counter for 8 hours with the bowl covered in plastic wrap. 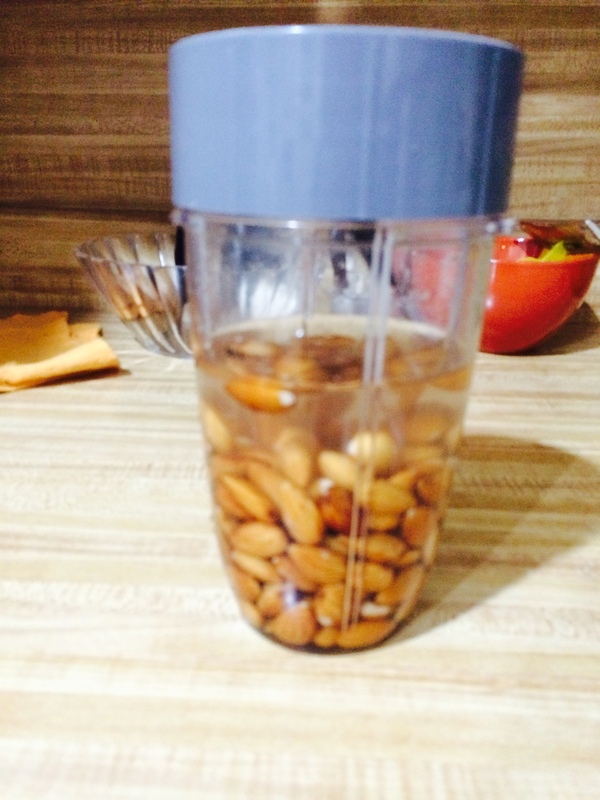 After the almonds have soaked, drain the water, rinse with purified water, and drain again. Blend until very smooth and creamy. Position the nut milk bag over a large bowl or container (I like using a square one so I can easily pour from that to another container to keep in the fridge as my creamer), then pour the blender contents into the bag to strain. 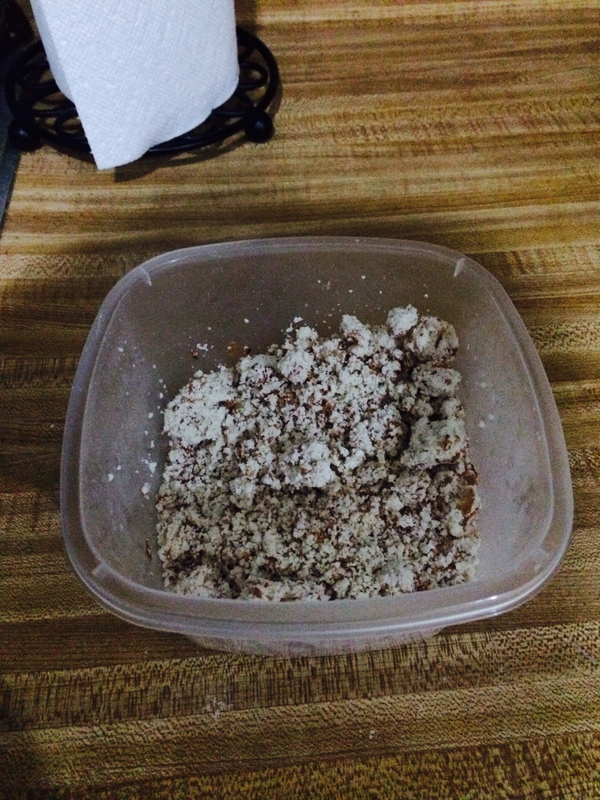 Leftover almond meal from the nut milk bag! I use it as is to make my Banana Fritter Bites…one batch makes me about 3 servings of the fritters! Transfer the almond milk to a sealed container (I used a rinsed out Coffeemate container that my roommate had, but anything you can pour from will work), and store in the fridge for up to a week. And there you have it! The stuff is delicious and nutritious 🙂 I haven’t tried adding anything to the creamer yet, but I’d imagine you could play around with adding things like cocoa powder, cinnamon, nutmeg, etc. If any of you make it and try some variations, please feel free to share!